What's The Difference Between Log and Timber Homes? What's the difference between log and timber homes? How are they different — and how are they alike? Read on and you be a log/timber home pro. 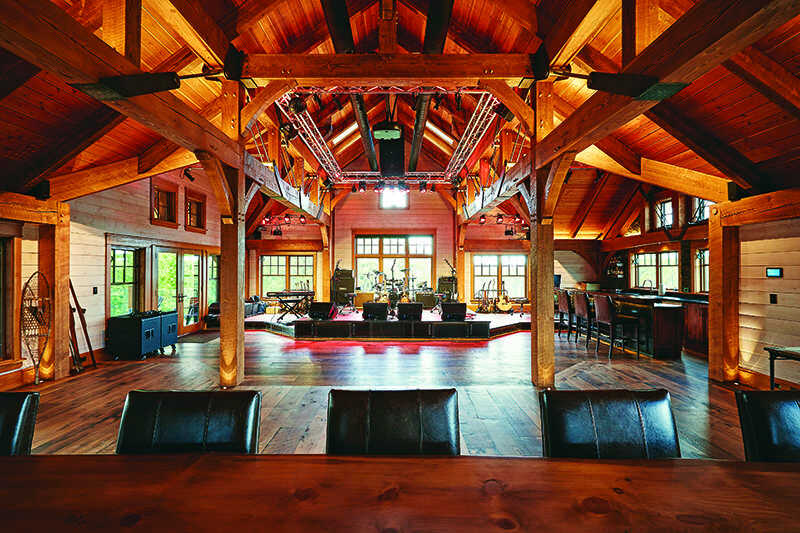 Log and timber homes share the open great-room concept, but timber frames like this one tend to really showcase the wood. Now is the ideal time to get ready to buy and build your log or timber home. How do you start? Start by liking wood. Wood, in the form of logs and hewn timbers, is the premise of these homes. They aren’t styles of homes, the way saltboxes, Cape Cods, bungalows, cottages, ramblers, ranches, Craftsmans, Georgians, Neoclassical, Federal, Colonials, Tudors, Victorians and McMansions are. Those kinds of homes are about their size and shape. Log and timber homes are about the way they’re built and the building material. Indeed, log and timber homes can assume many styles while remaining recognizably log or timber. Log and timber homes fall into the category of custom homes; that is, they’re individually designed and built on the owner’s site. Things like design, financing, buying land, finding a company to provide your building materials, finding a contractor — these are common to all custom homes. What ultimately sets log and timber-frame homes apart from other custom homes is the wood, specifically big timbers. Because there is so much variety within log and timber homes and so many companies producing them differently, buyers sometimes get sidetracked needlessly looking for which way is best. That’s understandable because for the most part, these are homes not many people are familiar with, especially the many variations on their big-timber theme. And people usually are nervous about not making the right move. Most choices involving log and timber homes, however, boil down to matters of personal preference, not finding the best or right or wrong. Some decisions will be determined by other choices. For example, choosing a particular company will usually dictate what wood species is used or the specific way the log or timber components are produced and assembled. If you have a preference in certain areas, by all means find a company that will give you what you want. That’s what custom wood homes are all about. Otherwise, find a company you like and whose way of doing business makes sense to you, and accept its wood and its way. Everyone probably knows what log homes are because they’re an enduring symbol of the American frontier and associated with various presidents, most notably Abraham Lincoln. You notice them in movies, on television, in newspaper ads. If you saw pictures of 100 different homes and only one of them was a log home, you’d probably recognize it immediately. And yet not all log homes look alike. Log homes are made by stacking the logs horizontally to form the walls, using the same piece of wood for the outside and inside wall. 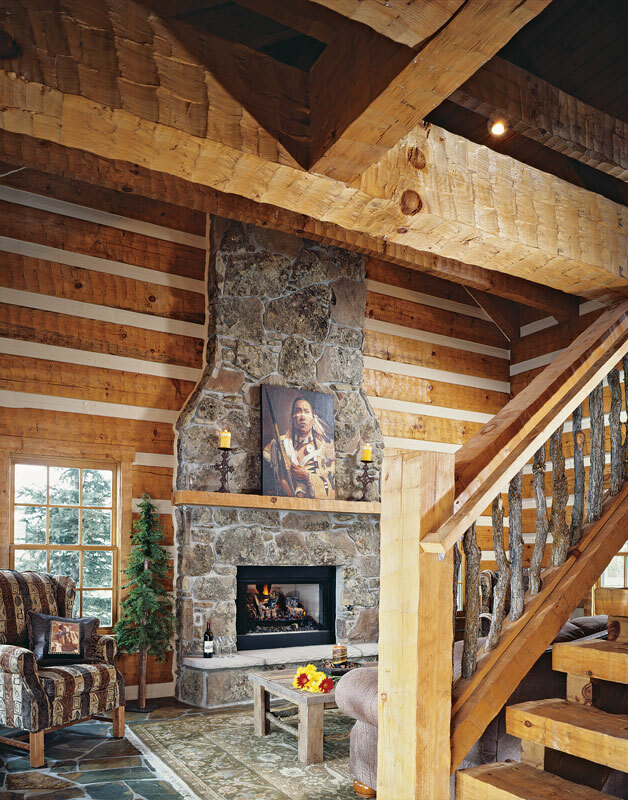 These walls usually feature an exterior embellishment that characterizes log homes: corners. Corners are formed whenever two walls meet. There are three basic types of corner: interlocking, intersecting and overlapping. Log homes originally were supported only at the corners, leaving a gap along the logs that was filled with chinking. Chinking became another signature feature of log homes. Even today, when almost all wall logs are supported along their entire horizontal surface, some homes still use chinking, both for aesthetics and to increase weatherproofing. What’s a Timber Frame Home? 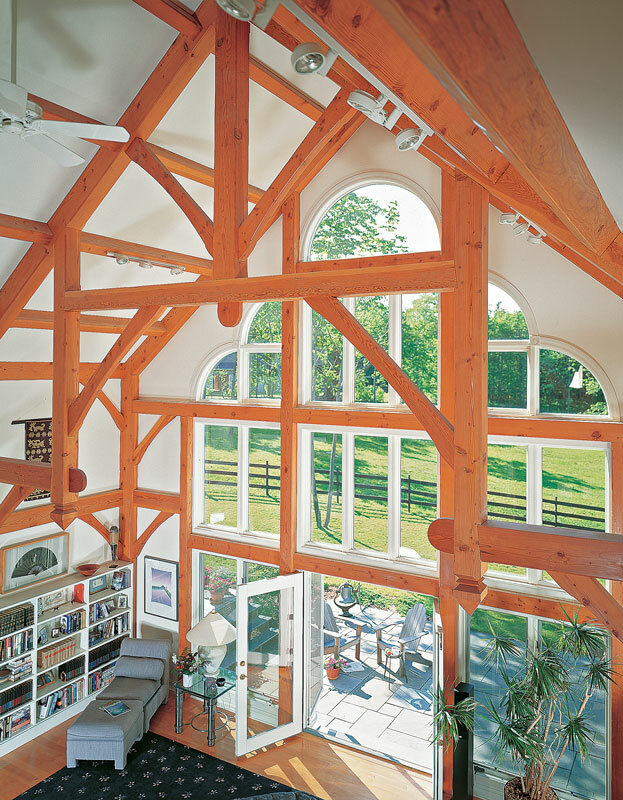 Timber framing is a kind of post-and-beam construction. Post-and-beam homes employ a big-timber framework, akin to a skeleton, of upright posts supporting horizontal beams. This interlocking frame supports the home’s load and transfers its weight to the foundation. Timber framing is a specialized version of post-and-beam that relies heavily on hand work to shape the timbers and fashion mortise-and-tenon joinery that is held in place with wooden pegs. Embellishments to the frame include chamfering, pendants and other decorative carvings. The frame’s interlocking configuration eliminates the need for load-bearing interior walls, assuring open rooms and, if desired, vaulted ceilings. This timber frame home has a spacious open plan. Timber homes also rarely offer a hint from the outside of the interior woodwork. This allows them to fit in with surrounding homes easier than log homes. Incidentally, although timber framing is a very old craft, yesterday’s timber frame homes were a far cry from the open-plan, cathedral-ceiling homes that many people associate with timber framing today. Timber frame homes were the earliest permanent residences built in England’s American colonies and remained the dominant building method until the development of balloon framing, which required little skill to build and answered the growing demand for hastily built mass housing. The main distinction between log homes and timber homes is how they use the wood. As a result, they achieve sharply different looks. And because timber homes can use a variety of exterior materials having nothing to do with the inside, they may not be recognizable as timber homes, whereas log homes are almost always identified as such, even though inside less log may be visible. In general, log homes have a horizontal profile, and timber homes are vertical. These tendencies result from the way the logs are laid and the post-and-beam frame stood up. For such remarkably different homes, timber and log homes have lots in common. Here are their most significant similarities. Both are custom homes, individually designed and produced, sold unassembled and built according to a calculated building system. Both have as their basis big timbers (round or square), skillfully, sometimes artfully fitted together to form the structure. Both flourished in early America, then fell into relative obscurity until the mid-1970s, when log homes and timber framing experienced first a revival and then a boom. They share certain design conventions: great rooms, open layouts, cathedral ceilings, walls of windows with great views, roof trusses, fireplaces and rustic styling or at least a casual air. They offer a variety of styles. The process of buying and building them is similar: Buy land. Design home. Prepare site. Build home. Furnish and landscape. Live your dream. Both involve moving to locations that are usually rural, sometimes remote (although timber homes aren’t as restricted). Because these locations probably aren’t ones you’re used to, it’s important to understand what you’re gaining and giving up before committing to owning one of these homes. Both are passion purchases: totally discretionary home buys that people make because they feel some emotional yearning to live in these homes. When it comes right down to it, most people choose a log or a timber home because they like the look. The quality of the building material or workmanship may play a significant part (certainly it affects the cost/value), but the appearance of the structure seems to be its paramount appeal and evokes the emotional interest. As you strive to own one of these homes, focus most of your attention on getting the look you love. What is a Log Building System?